You can securely purchase all our products on our website lotelduvin. All transactions are made via secure payment PayPal. Our contact and bank details are not replicated on thelotelduvin website. Why use PayPal as a mode of secure online payment? PayPal is a simple and secure way of making an online payment: More than 80% of users choosing Paypal are more likely to make a second purchase when using Paypal which inspire more trust and security than other online payment methods. PayPal is a online payment security website. You pay via credit or debit card without giving your credit/debit card number to the retailer and transaction are made instantaneously. •Your credit/debit card number is not given to the retailer. 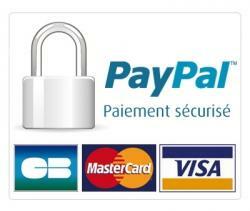 •Your are fully protected against non-authorized payment made to any website via your Paypal account. • All purchase is confirmed by a receipt. • You can pay faster when paying online. •You haev the choice to pay via credit/debit card or your paypal account . • You do not need to retype your credit/debit card information. DO I need to create a Paypal account in order to purchase ? No, clients do not necessarily need to create a Paypal account in order to purchase on our website. Use of credit/debit card is also an option, while enjoying the Paypal security standards, but for youth retailer and customers security, those transactions are limited in quantity of shipment and delivery which are detailed in the users guide. Can I pay by check and/or wire transfer ? Yes, on the lotelduvin website, you can also pay by check or wire transfers.